On the advent of the Southern Railway, the need arose to modernise the ex-SE&CR Kent Coast lines. This included the economising of duplicate routes, rebuilding of stations, and provision of new motive power and freight facilities. The most drastic of changes were destined for the Isle of Thanet, where the ex-SER route between Ramsgate and Margate was to be completely closed, and the ex-LC&DR line via Broadstairs was to be joined to the route from Minster by means of a 1½-mile-long connecting line. Upon the latter were to be provided two completely new stations: Ramsgate and Dumpton Park (a northern suburb of the former). 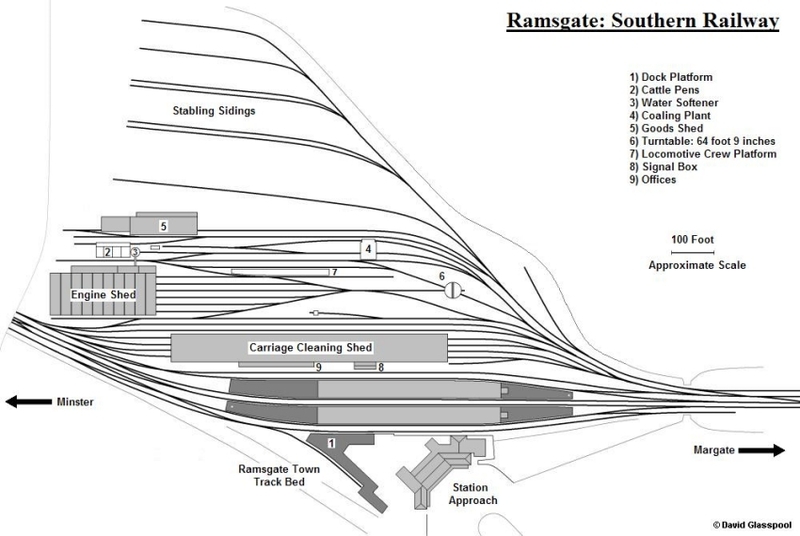 The new Ramsgate station was to be built on the former site of the SER’s triangular junction of the Margate Sands and Ramsgate Town lines, and the extent of this land would allow it to incorporate locomotive, rolling stock, and goods facilities. By the end of 1924, the Thanet reorganisation had been finalised. The programme included closing the existing engine sheds at Margate West, Ramsgate Town, and Deal, and pooling the locomotive allocations at a completely new £55,000 (about £2,195,000 at 2006 prices) complex at Ramsgate. For the record, new engine sheds for Kent Coast duties were also planned for Dover and Ashford. As far as passengers were concerned, the Thanet modernisation was formally complete in July 1926, on the opening of the new stations and associated connecting line, but it would be another 3½ years until the new Ramsgate depot was fully in use. 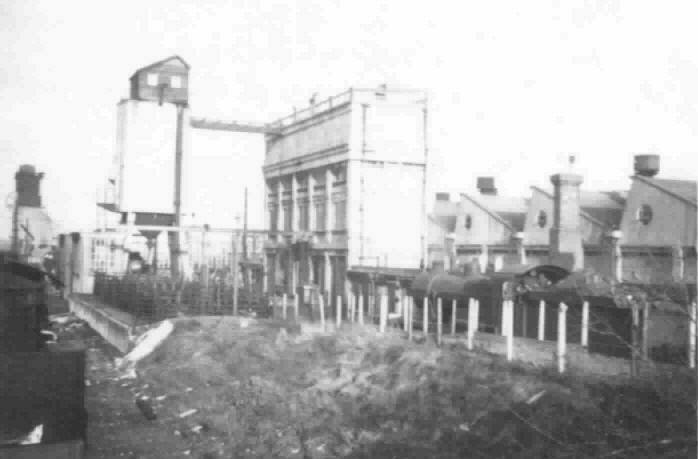 The sheds at Margate and Deal were retained until the new depot was commissioned, but that at Ramsgate Town was closed with the terminus station on the opening of the new Ramsgate layout in July 1926. The new Ramsgate station eventually comprised two 765-foot-long island platforms situated to the east of a multitude of tracks serving carriage, goods, and engine sheds. With reference to the latter, this was a six-track dead-end building positioned to the west of the carriage cleaning shed and platforms. It was fabricated from the SR’s favoured concrete, built around a steel frame, and demonstrated a ridge-and-furrow roof. The building measured approximately 100-foot across by 245-foot in length, and along its northern elevation existed the customary single-storey offices, but also a huge, imposing four-storey high water tower. Naturally, this was fabricated from the same material as the shed, and below the actual tank, within the tower structure, existed further offices. All six shed lines eventually converged to the east into a single track: engines could either proceed to the running lines by means of a direct single connection, or alternatively, travel via a 64 foot 9 inch turntable. The SR also provided an on-site mechanical coaling plant, which rivalled the water tower in height. This was positioned north east of the engine shed, about two thirds of the distance to the turntable. The hard, chalky nature of Kentish water saw the swift installation of a water softener, just three years after the shed fully opened. This cylindrical structure straddled the end of one of the engine stabling sidings and was fed by the adjacent water tank. Water softeners were also installed by the SR at Stewarts Lane and the new-build motive power depots at Hither Green and Dover. All descriptions thus far are later illustrated in diagram form. From the outset, several SE&CR 4-4-0 locomotive designs, including Classes D1, E1, L, and L1, made up a significant proportion of the ‘’main line’’ locomotive allocation here. Numerous Kent depots, Ramsgate included, also acquired batches of ex-SE&CR suburban tank engine types, particularly the 0-4-4 ‘’H’’ Class. Since the SR had pursued a policy of rapid electrification of Eastern Section suburban lines, those engines which formerly plied the London commuter routes were re-allocated to comparatively rural areas. Engine sheds of suburbia at Cannon Street, Orpington, and Slade Green, were closed, and the locomotive studs dispersed elsewhere. Class V ‘’Schools’’ engines began appearing at Ramsgate in great number from 1930, and by nationalisation, twelve Bulleid Light Pacifics had arrived on the scene. ‘’Phase 1’’ of the February 1956-approved Kent Coast Electrification Scheme signalled the end for the South Eastern Division’s engine sheds. Decline began in October 1958, when the separate ‘’74’’ shed code allocation was scrapped. Ashford motive power depot, hitherto designated ‘’74A’’, was recoded ‘’73F’’, and it and all those sheds under its wing (including Ramsgate) became sub to Stewarts Lane (73A). By this time, it had also been confirmed that Ramsgate would become host to major electric multiple unit facilities, which included general maintenance and heavy repair sheds. 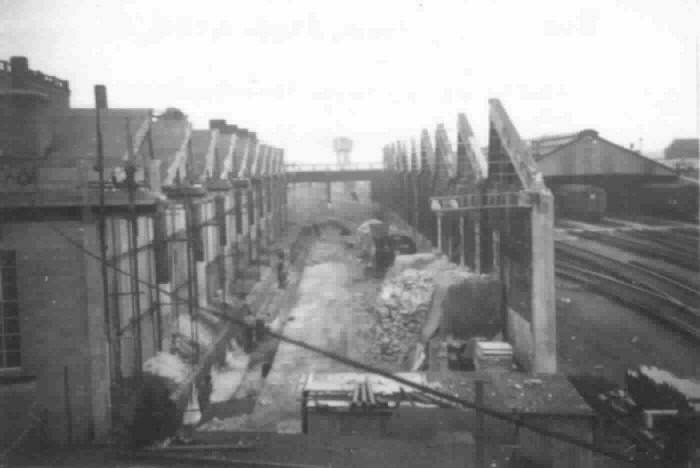 After the commencement of the full accelerated electric timetable on the ‘’Chatham’’ main line on 15th June 1959, work began on converting the existing engine shed into an EMU maintenance depot. The early stages of this work were undertaken concurrent with continued use of the yard here by allocated steam locomotives, the last of which left at the end of 1960. The southern third of the shed building was demolished, leaving two of the six depot tracks exposed. This elevation was subsequently sealed up with brown brick, and offices and the imposing water tank were retained on the northern side of the structure. To accommodate twelve-vehicle EMU formations, the shed received a 580-foot-long extension at its Margate end. This addition was pitched-roofed, comprised a steel frame clad with asbestos, and covered the four parallel-running tracks emanating from the shed. Heavy repair workshops were erected upon re-arranged stabling sidings to the north, and the 655-foot-long carriage cleaning shed to the south became an EMU inspection shed, all four of its tracks receiving third rail. The engine shed remains in its EMU maintenance role today, and in 2001, the extension of 1961 witnessed the removal of the dreary asbestos and the re-cladding of the steel frame with corrugated metal. Ramsgate: a track plan of the Southern Railway layout. Click the above image for an enlarged view.